Caroline Norton: wronged wife, heroine of English Laws for Women; novelist, poet, mother, wit and political lobbyist. We end our series with a personal heroine, a woman whose general neglect by historians is as amazing as it is heinous. Caroline was born into a family of three girls known as the Graces, dazzling grand-daughters of the Irish Whig playwright Richard Sheridan. Politics and London’s elite society were in their blood. London adored them. Caroline’s disastrous marriage to the boorish, stupid and grasping George Norton, whose family were implacable snobs and Tories, set in train a saga which spans that crucial period of English history from 1830 to 1850 when reform and reaction in Britain and across Europe created an extraordinary febrile atmosphere of intrigue, energy and style. These were the first years of Victoria: of the Great Reform Bill and Chartism, of the Pre-Raphaelites and the Railway Age; but also of poverty, factories, injustice and sobriety. Caroline knew everyone. 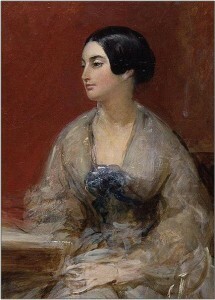 For a while her scandalous association with Prime Minister Lord Melbourne (former husband of Lady Caroline Lamb) threatened to wreck his career and bring down his government. It nearly destroyed Caroline. But the deliberate estrangement of her children by the dastardly George fired her to campaign for the rights of all women and mothers. Her legacy is profound and lasting. I have never mentioned money to you, and I hardly like to do it now; your feelings have been so galled that they have naturally become very sore and sensitive, and I knew how you might take it. I have had at times a great mind to send you some, but I feared to do so. As I trust we are now upon terms of confidential and affectionate friendship, I venture to say that you have nothing to do but express a wish, and it shall instantly be complied with. I miss you. I miss your society and conversation every day at the hours at which I was accustomed to enjoy them; and when you say that your place can easily be supplied, you indulge in a little vanity and self-conceit. You know well enough that there is nobody who can fill your place. An English wife may not leave her husband’s house. Not only can he sue her for restitution of “conjugal rights,” but he has a right to enter the house of any friend or relation with whom she may take refuge…and carry her away by force… If her husband take proceedings for a divorce, she is not, in the first instance, allowed to defend herself… She is not represented by attorney, nor permitted to be considered a party to the suit between him and her supposed lover, for “damages.” If an English wife be guilty of infidelity, her husband can divorce her so as to marry again; but she cannot divorce the husband, a vinculo, however profligate he may be…. Those dear children, the loss of whose pattering steps and sweet occasional voices made the silence of [my] new home intolerable as the anguish of death…what I suffered respecting those children, God knows… under the evil law which suffered any man, for vengeance or for interest, to take baby children from the mother.